Why give us a shot? At Highlight Printing Minneapolis, we think Post-it® Notes are a great way to stay "top of mind" with your clients and prospects. 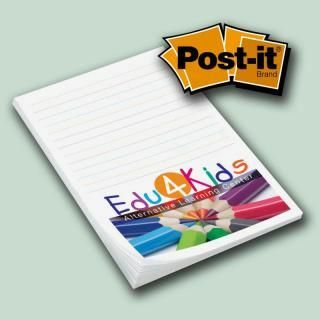 And as an Authorized Distributor of Post-it® Notes, we can promise you the best service and pricing available. 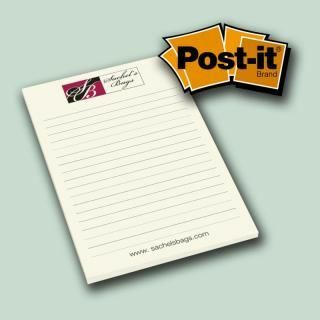 Post-it® Custom Printed Notes - 3" x 4"
Value Priced Program pricing includes up to 4 colors for the price of one. 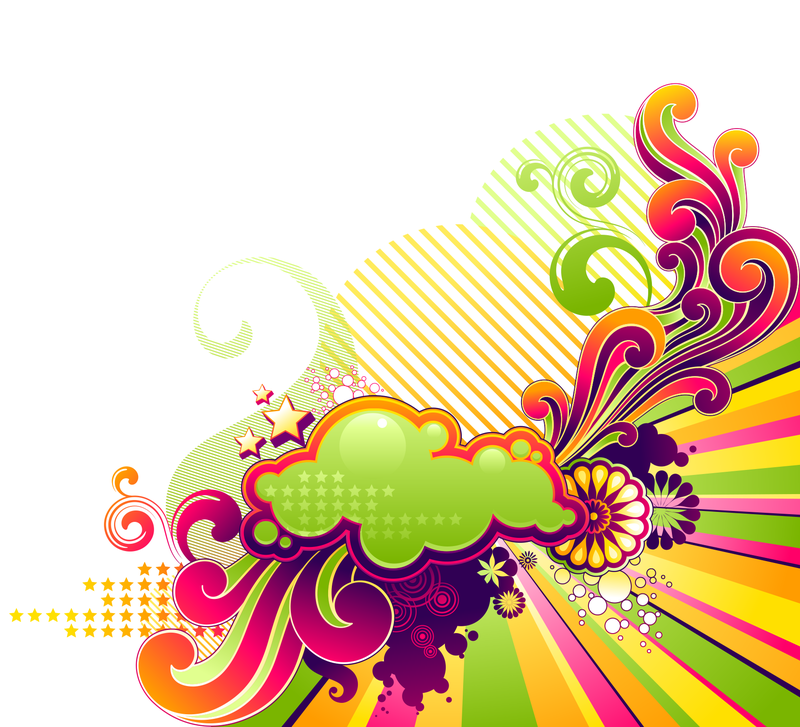 * With 4-color process you can print as many colors as you wish all a single price! Available in our most popular sizes! Recycled paper available, White only. 10% upcharge. Low quantity copy change available, call for details. Special 72-HOUR Quick Ship Production Time on Catalog Quantities: Allow 72 hours after receipt of complete order or after approval of proof. 72-hour production time good only for PD34P-25 note size using the Value Priced Program price listed per note pad. Standard catalog upcharges apply. Does not include recycled paper. Production Time: 5 working days after receipt of complete order or after approval of proof. 3M and Post-it are trademarks of 3M. ©3M 2010 All rights reserved. 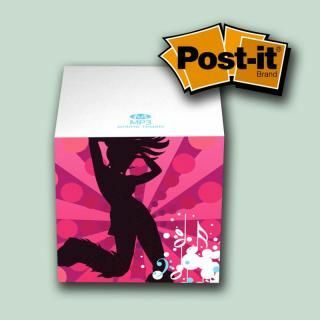 Post-it® Custom Printed Notes - 4" x 6"
Post-it® Custom Printed Notes — 3" x 4"
Exact color match printing allows you to match your exact imprint color. Two of our most popular sizes. Available in a wide range of sheet counts and a wide array of paper colors. Print a different message or graphic on each sheet with Changeable Copy. Available in Super Sticky for 10% upcharge, White paper only. Recycled notes available in White, Canary Yellow or Spring Green paper colors for 10% upcharge. 5 Day Special Service up to 2499 Quantity: Standard sizes only, White paper only. Standard inks only. Restrictions on bleeds may apply, call for charges and details. Die-cuts, copy change, custom backsheets, backside imprint, Super Sticky, recycled paper and alternating designs are not available. Production Time to Match Your Exact Color: 7 working days after receipt of complete order or after approval of proof. 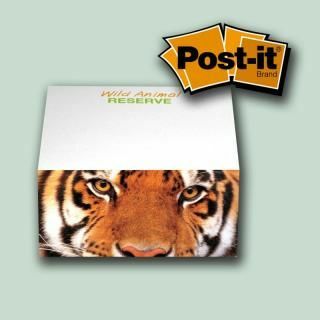 Post-it® Custom Printed Notes — 4" x 6"
Post-it® Custom Printed Notes Cube — C345 2-3/4" x 2-3/4" x 1-3/8"
Vivid, photo-quality images available on all 4 sides. Side printed with or without sheet printing. Imprint sides in 1–4 colors. Simple steps to design! Pastel paper available on quantities of 500 and greater. 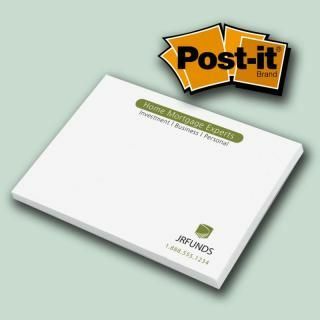 Same adhesive as our Post-it® Note pads. Special 48-HOUR Production TIme on 100–499 Quantity: Allow 48 hours after receipt of complete order or after approval of proof. 48-hour production time good only for 1 or 2 spot colors side printing (same 1 design on all sides). No sheet printing. Standard paper: White only. Does not include recycled paper. Standard catalog upcharges apply. Production Time: 7 working days after receipt of complete order or after approval of proof. Add 5 working days for sheet printing. 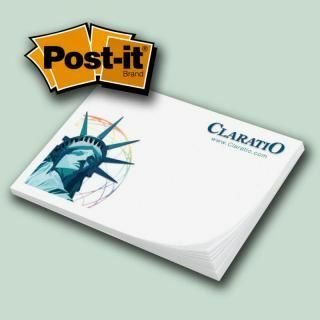 Post-it® Custom Printed Notes Cube — C690 2-3/4" x 2-3/4" x 2-3/4"
Contour Series with new sleek design and comfort grip! 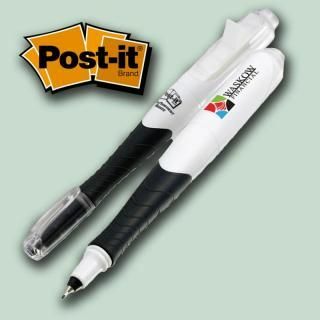 Two great marking tools in one — Post-it® Flags and ball point pen! Integrated flag dispenser is loaded with 50 Post-it® Flags. White barrel can be custom printed in up to 4 colors. Black ink ball point pen. 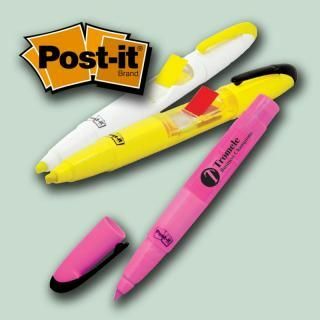 Two great marking tools in one — Post-it ®Flags and fluorescent highlighter! Chiseled highlighter tip allows for fine marking or turn sideways for wide areas of color. 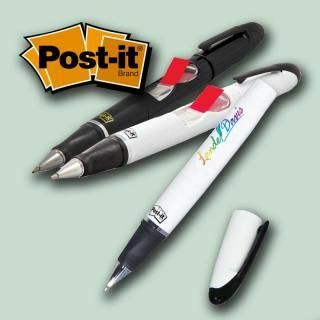 Two great marking tools in one — Post-it® Flags and permanent marker! 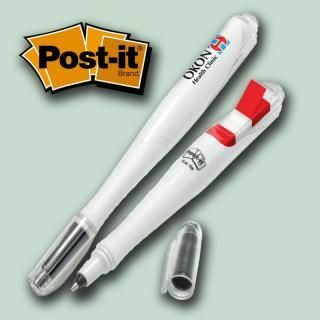 Ultra fine permanent marker tip is perfect for writing in small spaces. 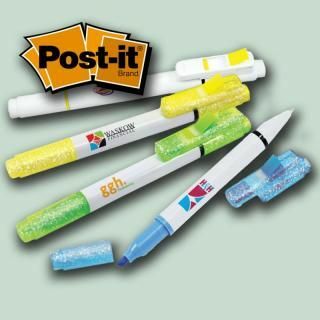 Trio Series is three great marking tools in one — Post-it® Flags, highlighter, and ink pen. Integrated flag dispenser in pen cap comes loaded with 50 flags. Available in 4 standard colors. Classic Series — Cover twists closed to protect flags when not in use! Easily fits into backpacks, briefcases, lab coats, and shirt pockets. Barrel can be custom printed in up to 4 colors. Available in a variety of standard colors. Individually wrapped in clear plastic sleeve and bulk packaged.